Many common weather sayings, like "April Showers Bring May Flowers" and "March Comes In Like Lion and Leaves Like A Lamb" don't really apply here in Northern California. Our showers come in the winter, mainly, and our spring comes early. Not so this year. We had a very dry winter, but we're experiencing a bit of a March Miracle as the rain has come down with a vengeance in the last week. Cold temps too, but it doesn't seem to stop the Mediterranean flowers from blooming. Our March wreath is a testimony to that. Glorious rosemary, so fragrant. The whole house smells of it. This is that upright cultivar, Rosmarinus officinalis 'Tuscan Blue,' rather than the one that crawls on the ground, Rosmarinus officinalis 'Prostratus.' Both are nice, but the flowers in the prostrate form are more gray than blue, and I do like this lovely lavender blue color. I have both forms growing in the garden, but neither one blooms, probably because I'm always snipping it for cooking. I found this bunch in the border of our nearby open space. 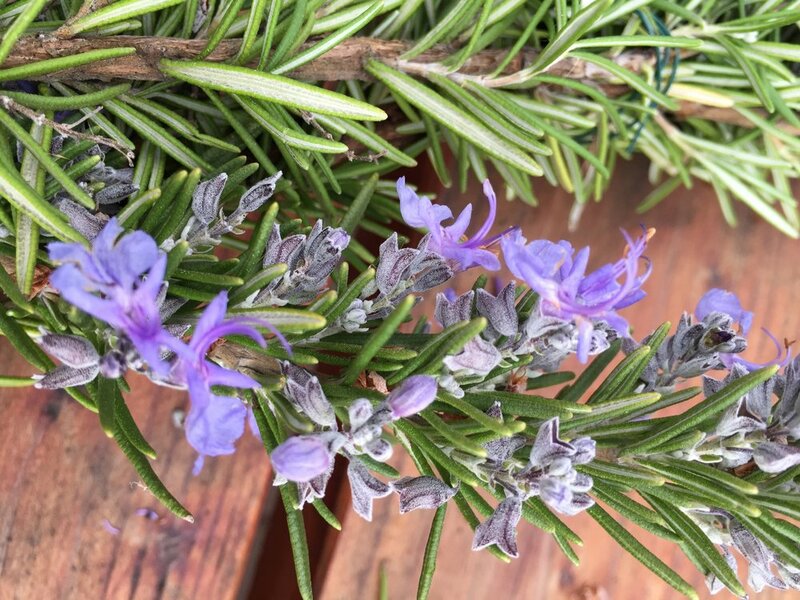 Rosemary is in the mint family, Lamiaceae, and I've always liked the old story about it; the Virgin Mary is said to have spread her blue cloak over white-blossomed rosemary when she was resting, therefore giving it its color. My first-weekend-of-March-chores include starting tomato seeds indoors, reseeding some peppers that had germination troubles, and opening the bee hive sometime when it's not raining. What are your weekend gardening plans?